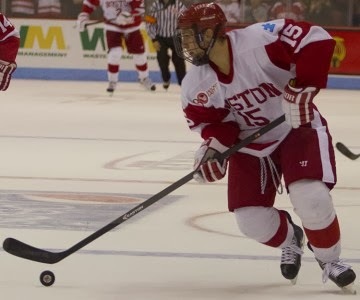 Terriers returned to the winning side of the ledger on Sunday with a 4-1 win against Connecticut at Agganis Arena. It was the first-ever game between the teams. After a scoreless first period when BU created numerous opportunities, the Terriers got on the board 33 seconds into the second period. Danny O’Regan took a Matt Lane pass in the left circle, deked the Husky goalie and slid the puck past his glove. Five minutes later, BU doubled its lead on Nick Roberto’s wrist shot from the right circle with assists going to Robbie Baillargeon and Matt Grzelcyk. Then late in the period, with the Terriers on the power play, Evan Rodrigues set up Grzelcyk for a one-timer that was deflected home by Kevin Duane. After UConn spoiled Matt O’Connor’s shut out attempt in the third period on a Brant Harris goal that beat the Terrier netminder short side, BU closed out the scoring with a Baillargeon empty-netter. Former Terrier captain Joe Pereira was on hand as an assistant coach on the staff of first-year UConn coach Mike Cavanaugh. SB Nation’s Jeff Cox talked with Quinn about the progress of freshmen blueliners Dalton MacAfee and Doyle Somerby. 2014 recruit Jack Eichel was named CCM Forward of the Week in the USHL following a seven point weekend (3g, 4a) as the NTDP U18s swept Green Bay. He leads the U18s with 13 goals and has a 13-15-28 line in 15 games. Last season’s captain, Wade Megan, was recalled to Florida’s AHL affiliate, San Antonio, after beginning the season with ECHL Cincinnati. The left wing from Canton, N.Y., had nine goals and six assists in 11 games and was second in the league in goals and the Cyclones points leader. He was the Panthers’ fifth round draft pick in the 2009 entry draft. Former BU goalie and 2008-09 national rookie of the year Kieran Millan was recalled from CHL Denver to AHL Lake Erie for the second time this season.